Longest Run So Far! | Run, Lindsay, Run! Today, I ran the longest distance I’ve ever run to date: 14 miles. I know this distance is just going to increase from here on out as I continue training, but it was a cool milestone to reach! Previously I had done 13.1, the 1/2 Marathon race. The start and end of my run were the hardest parts…I think it takes me about 3 miles to actually wake up my mind and legs when I get up before 6! After I set into a groove in Central Park, I didn’t start to feel it until around 11 miles. I hit some good rolling hills, which is nice training for the NYC course. I do want to try to do more bridge running like I did 2 summers ago when I lived downtown. Those long inclines creep up on you, but I love the views. 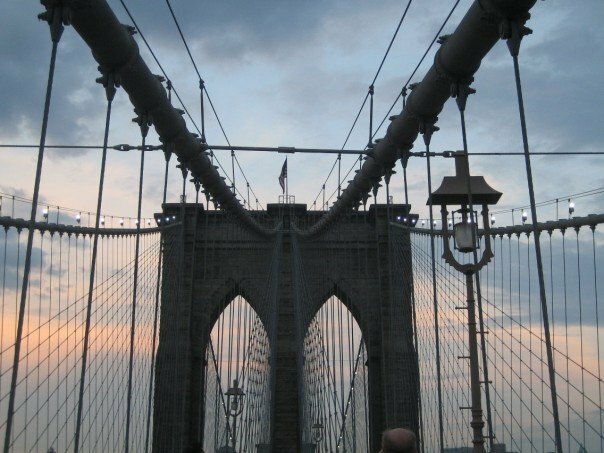 The Brooklyn Bridge is my favorite…when not flooded with slow tourists. Anyways, my legs were a bit sore but I surprisingly wasn’t too drained today. My stomach was a bit out of whack but felt better after eating! Oh, and that grande red eye from Starbucks may have played a role, too. I also have recently become addicted to Ginger Tea. 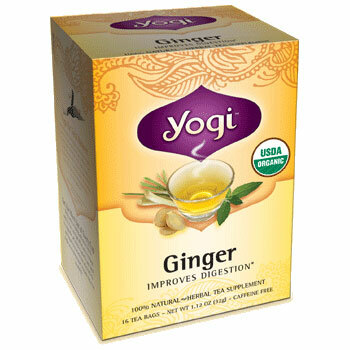 I love the taste of ginger, and this Yogi brand tea I found at Trader Joe’s is great. Apparently it helps with digestion? Whatever, it’s tasty. On the food menu: I had some greek yogurt with tons of berries and dry oatmeal mixed in for breakfast, a fresh white peach for mid-morning snack, a chopped salad with buffalo chicken, egg whites, carrots, tomatoes, broccoli and romano cheese for lunch, some random candy for an afternoon snack (hey, i have a sweet tooth! )…and then I went out to dinner with an old friend and got a chicken burger with caramelized onions, avocado and honey mustard. And a few nibbles on my side of fries. YUM! Think that’s a pretty balanced day…maybe…maybe not. You be the judge. As I mentioned, tonight I had dinner with an old friend, Laura. Laura and I were best friends when I lived in the town I grew up in until I was 10, Montclair. We stayed close and went to summer camp together like 5 years after I moved, it was a nice way we kept connected. We always try to get together in the summers when we’d been interning in the city…now that we’re both full-time and she lives in Montclair, we have to make it happen more! It was great catching up. So much has changed since we got together last August. My life is in a completely different place, completely different than where I expected it to be right now. And I think I’m okay with that, and actually enjoying it. Better to keep things unpredictable, right? Right. Good. Tomorrow night I’m going to my new “home” for the first time. My family sold our house in Basking Ridge last Friday, and mom moved to a new apartment in Montclair this week. Yes, back to the town where I lived for the 1st 10 years of my life! It was sad saying goodbye to the gorgeous big house I had lived in for 13 years, where we had so many memories as a family. But at the same time it marked the close to one chapter of life and start of a new. Fresh starts!